Proprietors Maria and James “Cake Chef” Carrozza built the new “Cookie Jar New Dorp” bakery as a twin to their West Brighton establishment. While it’s attached to their casual restaurant and bakery Piece A Cake next door, this newest business has a personality of its own, courtesy of the design. Ray Plaza, Maria’s brother, constructed an ever-flowing gushing water pipe that serves as the centerpiece to Cookie Jar New Dorp. “He built this so it constantly recycles the same water on display. He built it to simulate the one in the Chelsea Market in Manhattan,” explained James. 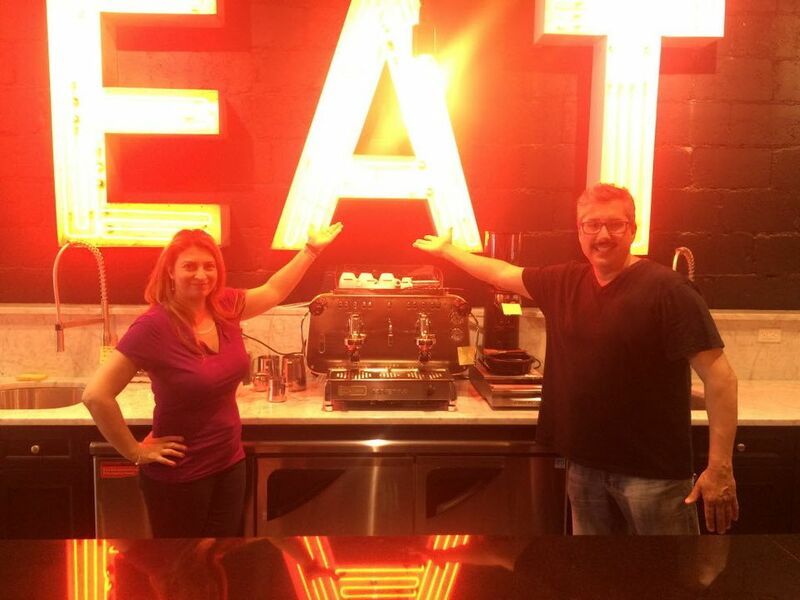 Letters spelling out “Eat” hail from a neon sign formerly of Bayside Fuel Oil of Brooklyn. The wooden bench along a brick wall comes from the recently defunct “Your Baker” of Bay Ridge, Brooklyn. Also from that long-time business: A pastry work table for the kitchen and a wooden table top to be used for communal dining. “My dining room is not ready with tables and chairs yet — but I’m hoping that will be coming in September,” said Maria. So, for now, the space, marked by granite and marble counter tops, is stark. It shows off the 70 varieties of cookies and antique bric-a-brac. The restroom ceiling was created from a roller conveyor belt from former Twin Restaurant Supply of West Brighton. Cookie Jar New Dorp quietly opened on July 4, and just to recap: Cake Chef in Castleton Corners came about in 1988. Cookie Jar of West Brighton was the next Carrozza venture to happen in 2007. And Piece A Cake, with its bistro and breakfast menu, was born in 2012. “We’re hoping people from mid-Island and the South Shore will come here if they don’t want to go all the way to Forest,” said James. The store is unmarked at the moment. “We’re waiting to get the sign because it’s a carved sign and it takes a long time,” said James. He projects another bakery down the line sometime although Maria hopes for many locations in the future. “He’s more conservative,” said Maria with a smile. The compliments from customers motivate the couple. — Cookie Jar New Dorp is located at 181 New Dorp Lane, 718-979-4500; CakeChefCookieJar.com.